MARITAL STATUS: Married to wife Eliza. CHILDREN: Daughter Emma, who was born in 1991. 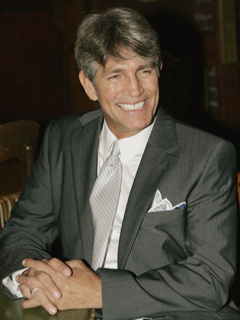 Eric Roberts was born in Biloxi, Mississippi, but grew up in Atlanta. He began his acting career at age 5, appearing in a local theater company called “The Actors and Writers Workshop,” founded by his father, Walter Roberts. He continued studying acting and appearing in theater during his formative years. His sisters Julia Roberts and Lisa Roberts Gilan, and daughter Emma Roberts, are also actors. Though Roberts appeared in a short-term role on the short-lived soap, HOW TO SURVIVE A MARRIAGE, his first major break was originating the role of Ted Bancroft on ANOTHER WORLD in 1977. Shortly after leaving the soap that same year, Roberts was cast in a star-making role in the feature film, King of the Gypsies. Based on that film’s success, he starred in several movies and received Golden Globe and Academy Award Nominations. In 1987, he earned The Theatre World Award for his Broadway debut in performance Burn This. During his decades as a major actor, Roberts has experienced personal strife. In 1981, he was in a car accident that resulted in restorative plastic surgery to his face. He also suffered a broken collarbone and an injured hand. In the past, Roberts has struggled with substance abuse. In 2010, he appeared on the VH1 reality series, CELEBRITY REHAB, because of a dependency on medical marijuana. His official Web site is http://www.ericrobertsactor.com/nq.html. -	was portrayed as a clay figure on MTV's CELEBRITY DEATHMATCH. is trained in Tae Kwon Do and Jujitsu. is good friends with Stone Cold Steve Austin. guest-starred as a celebrity panelist on the game show, THE HOLLYWOOD SQUARES. Shawn Christian (Daniel, DAYS) has cast Eric Roberts (ex-Vance, Y&R) in his latest project, SPANNERS.